The UK is in the midst of an unprecedented sushi boom. It’s becoming easier and easier to grab a package of Japanese sushi on your way home. But just as with any imported cuisine, sometimes you get something close to the original, and sometimes you get something that has been tinkered with and adjusted to fit the ingredients, the taste and the creativity of the receiving country. For example, pizza is really popular in Japan but many Japanese pizzas are a long way away from the Italian original. Anyone for curry or teriyaki flavour pizza? How about mayonnaise, Korean, or mochi and pineapple toppings? The thought alone probably terrifies native Italians. So, how does British sushi stack up? Our expert panel of native Japanese decided to do a tasting. We started by sampling the easiest sushi to lay your hands on – that sold pre-packaged by the big supermarket chains. 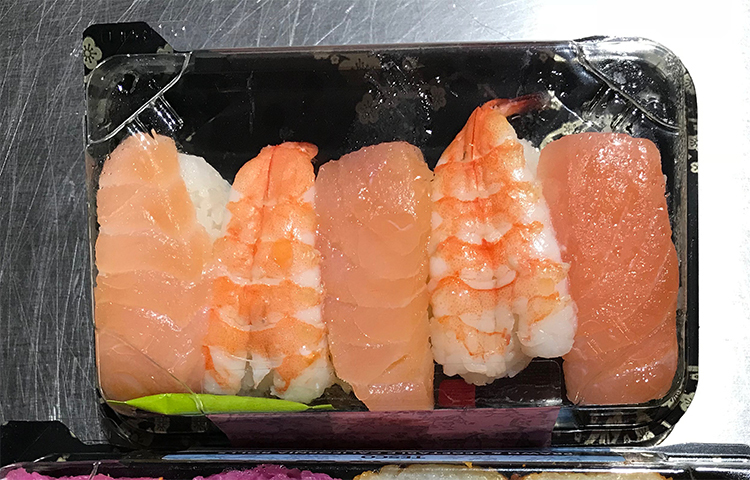 We decided to focus on the supermarket’s own brand nigiri and maki roll sushi, rather than that made at a sushi counter. 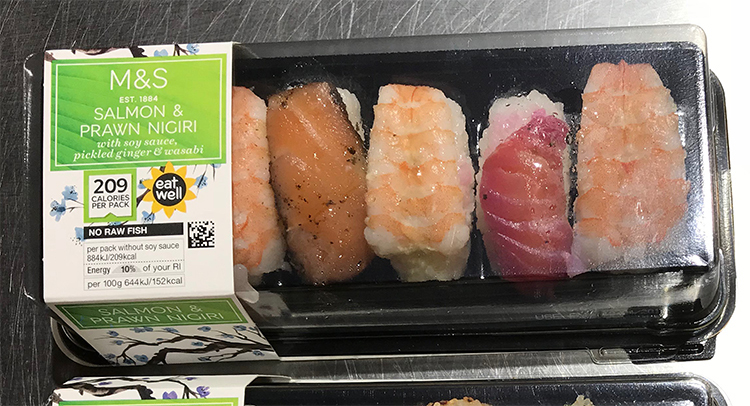 The supermarkets that have their own branded sushi are M&S, Sainsbury’s, Tesco, and Morrisons. 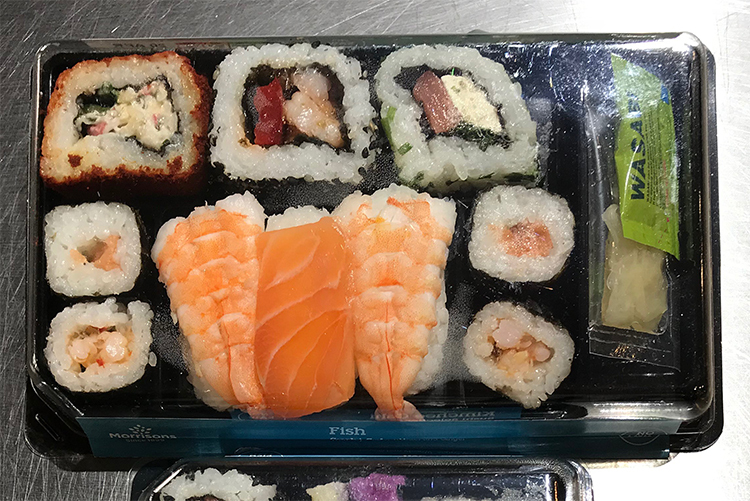 Waitrose does sell sushi, but it doesn’t have its own brand so it was disqualified from our taste-test. The first thing we noticed was the best-before dates. They are good for three days after purchase. But even if you kept your sushi in the fridge, there is no way that raw sushi would last that long. Finally we figured out what was going on. Of which, more later. So, let’s get straight to the tasting. We started with the nigiri. All of the supermarket brands include salmon and prawn. We tried the prawn first. From the left. M&S, Sainsbury’s, Tesco, and Morrisons. We lined them up on the plate to compare their visual appearance. They seem to use the same basic ingredients as the prawns looked virtually identical. We tasted the M&S version first. You get more rice than with the other brands. The taste of the prawns themselves was pretty good, and the rice was good quality too. But when we took a bite without adding any soy sauce, hmmm, it tastes different to the usual prawn sushi. Is it the wasabi? No, that’s not it. 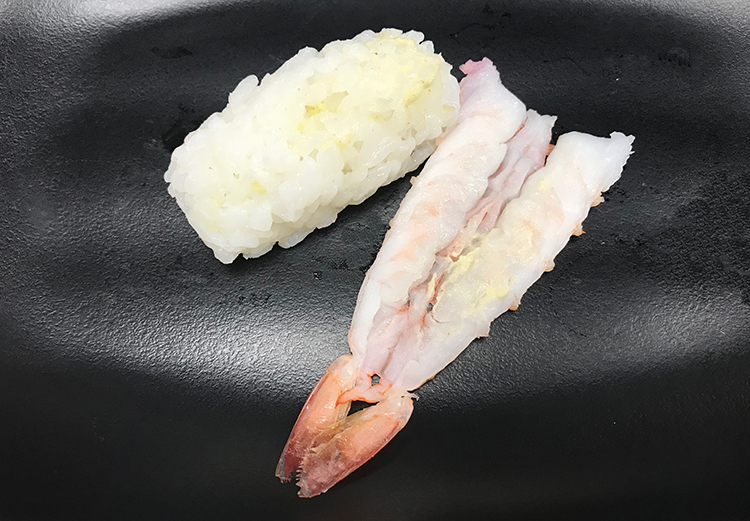 It feels like there is something between the prawn and the rice. We dissect the nigiri to investigate and discover a mysterious substance. We taste it and it’s oily. Butter? No, the nearest taste we can guess at is maybe mayonnaise. Maybe prawn by itself tasted too plain to the supermarket testers so they thought they needed to add something extra? Or perhaps they were inspired by the California Roll?? Next up was Sainsbury’s. The first impression was that rice was very dry and it had a hardness that suggested it had not been fully cooked. The vinegar taste of the rice was very strong and it was overly sweet too. Tesco’s prawns looked really good, but take a bite and we found the same mayo-type taste as M&S. The rice was pretty dry and unappealing too. Morrisons had no weird mayo. Their rice and sushi both tasted pretty good. 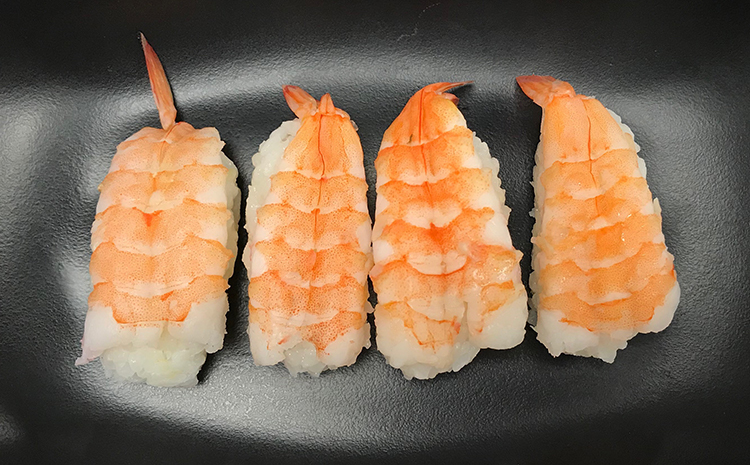 In conclusion for our prawn sushi tasting, your results will really depends on how fond of mayo you are. For us, we would have preferred it with no mayo. Also, rice is a really important element for sushi. It can’t be too soft, or too dry, or too hard. Putting all of these elements together, in our tasting we would give first place to M&S and second to Morrisons. Sushi isn’t supposed to be good for three days, so hard rice is probably unavoidable. Our recommendation is to check the dates and buy the freshest pack you can find on the shelves.